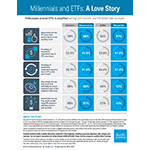 SAN FRANCISCO--(BUSINESS WIRE)--Both individual investors and Registered Investment Advisors (RIAs) say ETFs have positively changed the way they invest and both groups plan to increase investments in these products in the years to come, according to the newest installment of the annual ETF Investor Study by Charles Schwab & Co., Inc. (“Schwab”). 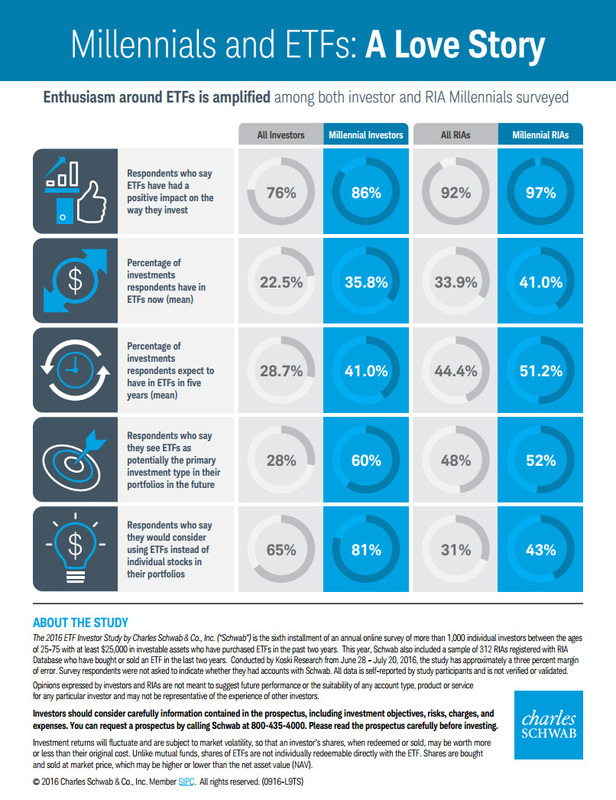 The survey, which explores the attitudes and behaviors of individual ETF investors, also explores the perspective of RIAs for the first time since the annual survey debuted in 2011. RIA adoption and understanding of ETFs stands out as notably strong, underscoring the pathfinder role of advisors in incorporating ETFs into their investing strategies for clients. More than nine out of 10 RIAs (92 percent) say ETFs have had a positive impact on the way they invest for the portfolios they manage, with 44 percent indicating the impact has been substantial. RIAs currently hold an average of 33.9 percent of investments in ETFs, and believe that could increase to an average of 44.4 percent in five years. In the last year alone, more than half (52 percent) of RIAs say they’ve increased investments in ETFs, and 12 percent say those increases were significant. If their client had an extra $100,000 to invest, RIAs say they would put an average of $43,600 into ETFs. In the year ahead, 54 percent of RIAs say they plan to increase their investments in ETFs. Looking even further out, nearly half (48 percent) of RIAs say they see ETFs as being the dominant investment type in the portfolios they manage in the future. Individual investor adoption of ETFs also continues to steadily rise. Three out of four investors surveyed (76 percent) say that ETFs have had a positive impact on the way they invest their money. On average, individual investors who use ETFs are now allocating nearly a quarter (22.5 percent) of their total portfolios to the products, compared to just 16 percent in 2012. And by 2021, individual investors expect their allocations will increase to 28.7 percent. In the last year, 44 percent of investors say they’ve increased investments in ETFs, and 10 percent say those increases were substantial. And in the year ahead, 43 percent of investors say they plan to increase their investments in ETFs, with eight percent saying they expect those increases to be significant. In fact, individual investors say that if they had an extra $100,000 to invest, an average of $37,300 would go into ETFs. “Individual investors, particularly when compared to RIAs, really view ETFs as a product that can solve for some of the challenges they face when investing on their own. Sixty-five percent of those surveyed say they would consider using stock-based ETFs instead of individual securities in their portfolios. And, notably, more than a quarter (28 percent) of investors say they can envision ETFs as the primary investment type in their portfolio in the future,” added Fischer. The 2016 ETF Investor Study by Schwab examined where investors and advisors seek out information and education about ETFs, and found a heavy emphasis on the materials and educational resources provided directly by ETF providers. 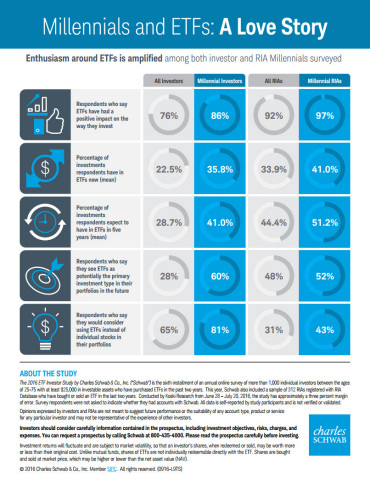 The 2016 ETF Investor Study by Schwab is the sixth installment of an annual online survey of more than 1,000 individual investors between the ages of 25-75 with at least $25,000 in investable assets who have purchased ETFs in the past two years. This year, Schwab also included a sample of 312 RIAs registered with RIA Database who have bought or sold an ETF in the last two years. Conducted by Koski Research from June 28 – July 20, 2016, the study has approximately a three percent margin of error. Survey respondents were not asked to indicate whether they had accounts with Schwab. All data is self-reported by study participants and is not verified or validated. A leader in the retail ETF market, as of July 31, 2016, Schwab had $287 billion in ETF assets custodied on its platform. More information is available at www.aboutschwab.com. Follow us on Twitter, Facebook, YouTube and LinkedIn.